If you’ve never designed a building that’s actually been built, the closest thing I can liken this process to is the birth and rearing of a child. While in most cases you had a great deal of fun making the baby – there’s always that anxious anticipation that exists while you wait nine months for it to finally reveal itself to the world. Prior to the birth of my first son I remember constantly wondering: what’s he going to look like? What are people going to say about him? Is he going to be healthy…with all his fingers and toes? Am I even worthy of the privilege of being a parent? The reality of the matter is there’s quite a few variables that contribute to how things will ultimately turn out – some in our favor and others that challenge us as individuals. Either way as parents we learn to shoulder that responsibility and forget about excuses. As a father of three (two boys and one girl), I can truthfully say that each of my children are unique with their own little quirks and temperaments; what works for one doesn’t necessarily work for the other, and they certainly test my patience from time to time…well, actually on a daily basis. Be that as it may, in my eyes they are adorable – I’d do absolutely anything for them and although the existence of those “little personality quirks” are trying and sometimes less than appealing in public, they are my kids and I love them to death. The same is true with buildings that we as architects design. We invest countless hours during pre-development in pursuit of being selected for the project. We then spend months conceptualizing, studying the site, responding to existing context, interpreting code requirements, attending public meetings, and pitching design ideas to owners, all while attempting to balance the ever-changing variable we loving refer to as the budget. We fight in behalf of sacred cows (key design elements) that often get slaughtered, we passionately debate scope, and we ride the tide of political will…something we as architects were never prepped for during the college years. Finally at the end of six to eight months of design/documentation and ten to fourteen months of construction it’s time for opening day at the ballpark. There’s no tell-all journal published that outlines the arguments over additional services, change orders, screw-ups in the field, or squandered design opportunities; on occasion we actually show up to opening day with a few scars…but that’s our job as the architect, we shoulder the responsibility and forget about excuses. While there’s always things we wish we could go back and change, there’s always that one thing that we adore about our design – until someone decides to knock the building down, no one can take that away from us. 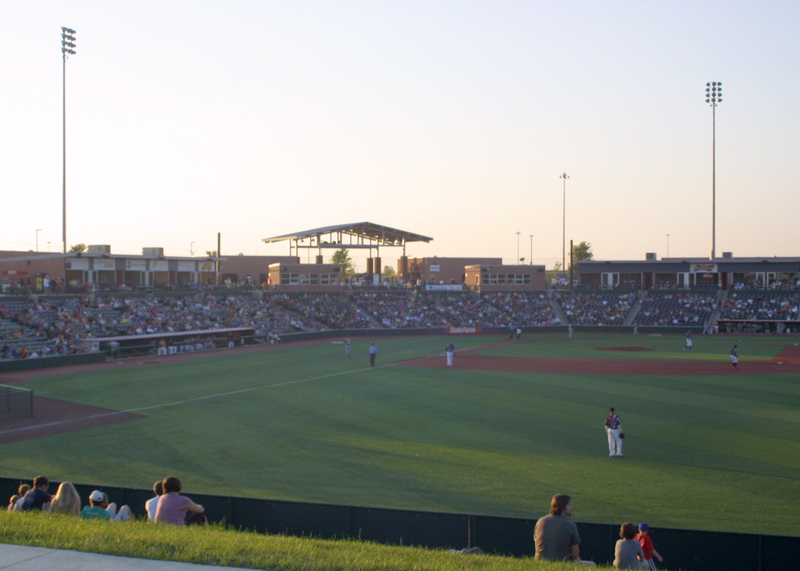 In 2008, when Pendulum Studio was commissioned to design a $9,000,000 multi-use ballpark on the Heartland Community College Campus, we knew going in that the budget was tight, so our strategy was simple…keep it simple. Now that the facility is complete and in the midst of its second full season of operation we were invited back to lead a tour for 50 fans interested in the inner workings of the facility. To be honest, this process was as informative to us as it was intended to be for the fans – this kind of exercise is a great way of gauging if we were successful in executing what we set out to accomplish; aside from operational feedback from the team, who better to hear it from than dedicated fans? 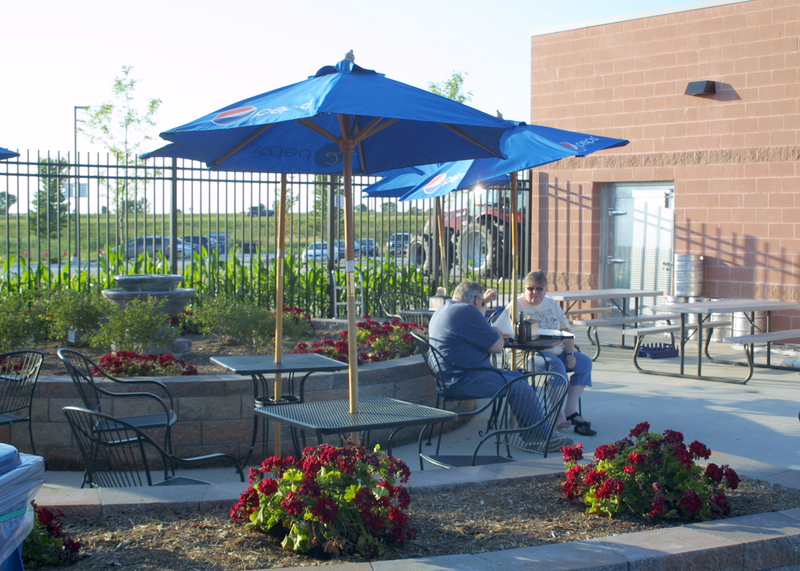 The main entry concessions behind home plate are flanked by keg storage rooms and adjacent open patio areas that were originally intended to serve as beer gardens with tapped counters and bar stools. Although the beer gardens were not executed in the initial build, beer lines and power has been stubbed up in the appropriate locations for future use. In the interim both areas have been landscaped to offer a nice getaway from the hustle and bustle of the busy main concourse. 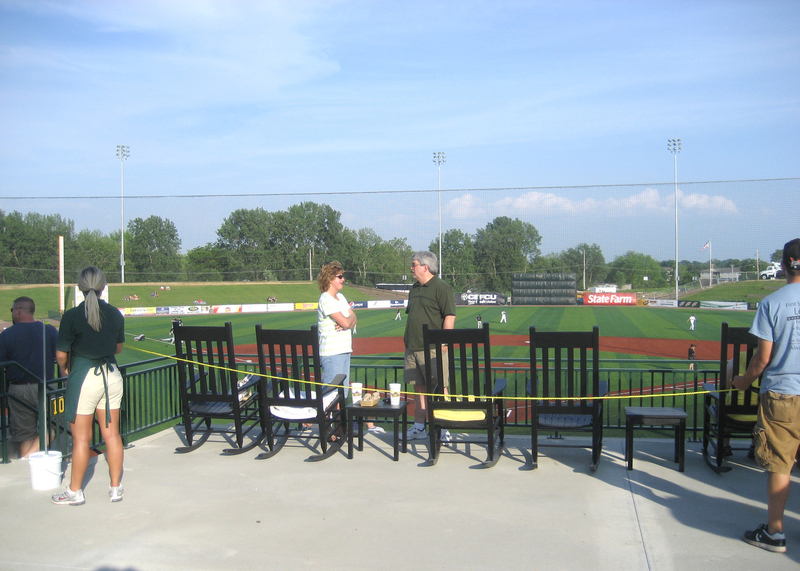 As you work your way down the first base concourse toward the outfield entry there’s no shortage of grass berm seating – room for approximately 1,500 down each line – 3,000 total. We engineered the slope at grade identical to the seating bowl to allow for future expansion of additional seating sections, group decks, and party areas as demand rises and funding becomes available. 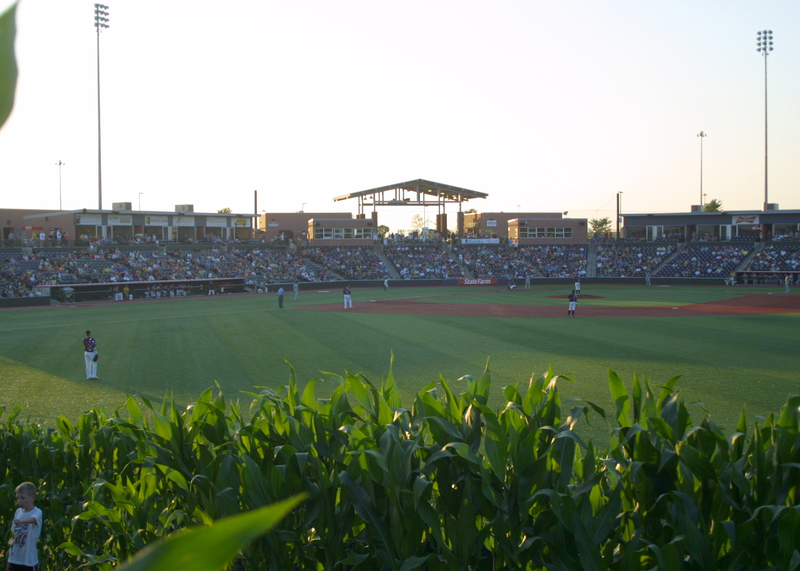 The outfield wall was intentionally designed to be low and deep to create great lines of sight even at the lowest points near the base of the wall. 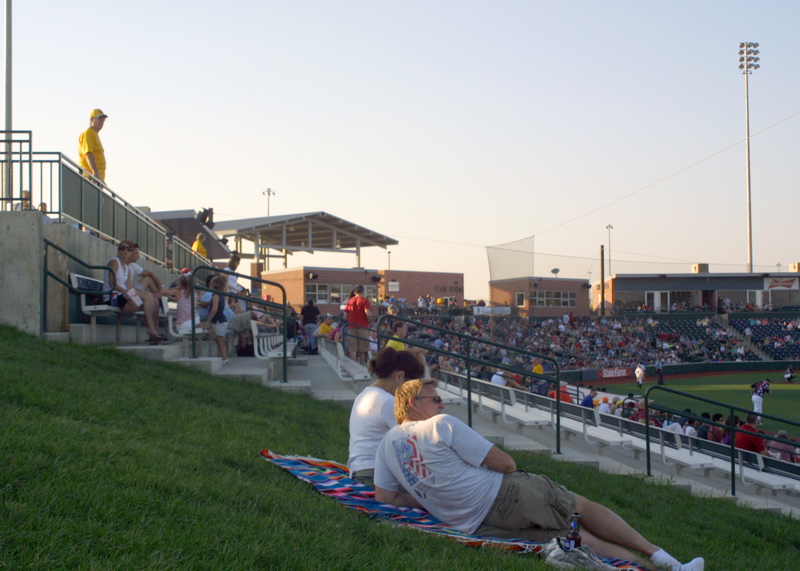 There’s a future opportunity for the installation of drink rail and sponsor advertising at the top of the berm along the concrete walk – the picture below illustrates this vantage point from the top of the berm; the only thing that would make this experience better is an ice-cold beer in your hand. The scoreboard below is positioned just in front of the locker room facilities in right-center. 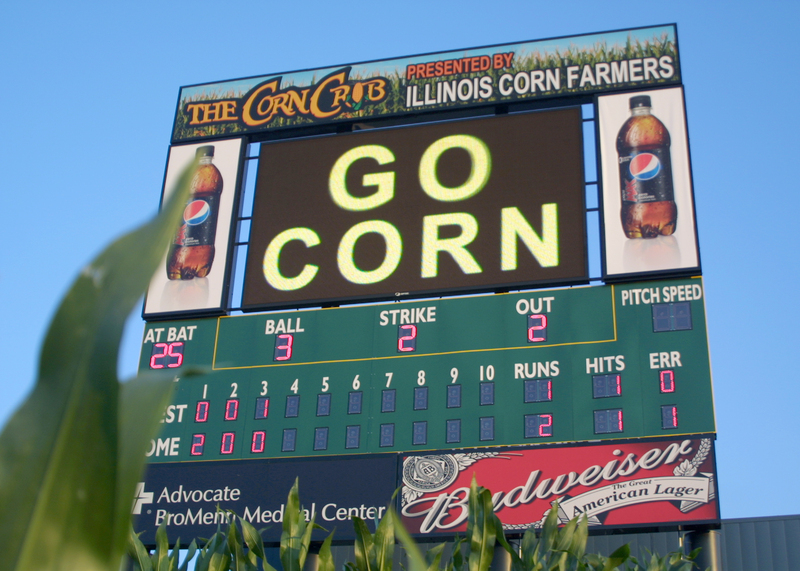 When the home team takes the field, they walk directly out of the locker room under the scoreboard, then down through the corn to the playing field surface. Phase one of this project involved a great deal of pushing and pulling. We stretched our dollar pretty far and created a nice starting point for where we’d like to see things ultimately go a season or two down the road. The future addition of concourse roof covering, drink rails in the outfield, group decks, outfield entry roof to match home plate, the installation of our original 20′ x 40′ drive-in movie screen and finally a pedestrian bridge to connect both ends of the concourse will help the facility to fill out a bit and grow to full maturity. It’s going to take time to get there, and the $1M that’s required to make it happen is not going to be easy to obtain but as my father always says, “timing is everything”. 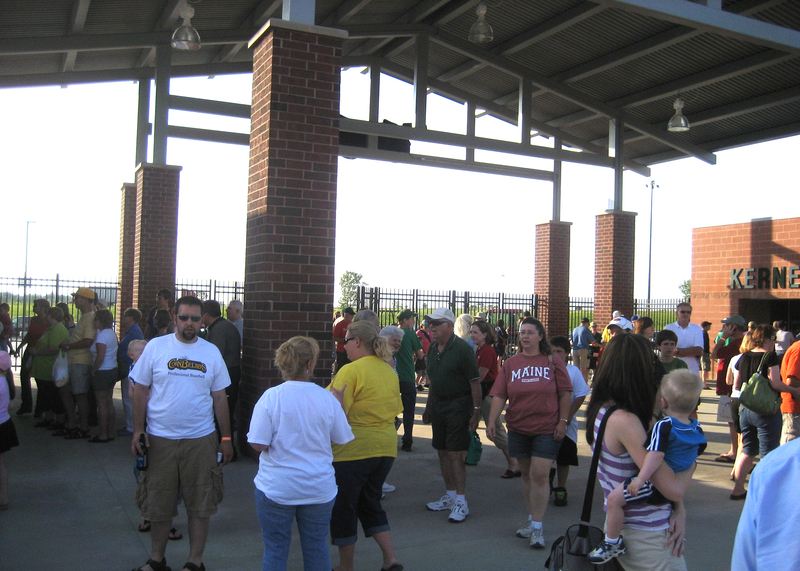 With an announced 3,100 in the crowd and an actual attendance of approximately 2,500 on a friday night (7/8/2011) and with the expectation of 5,000 on Saturday for the game followed by their first concert, I’m confident they will make it happen sooner than later. 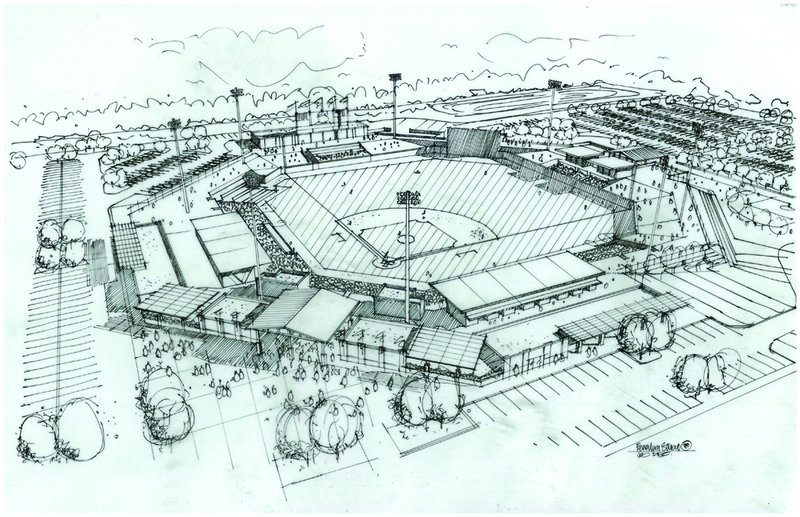 As I mentioned at the outset of this post, designing and constructing a building – in this case a ballpark, really is like birthing and rearing a child. There’s a lot of give and take, a little sacrifice here and there but as designers, architects, “parents”, we shoulder that responsibility. 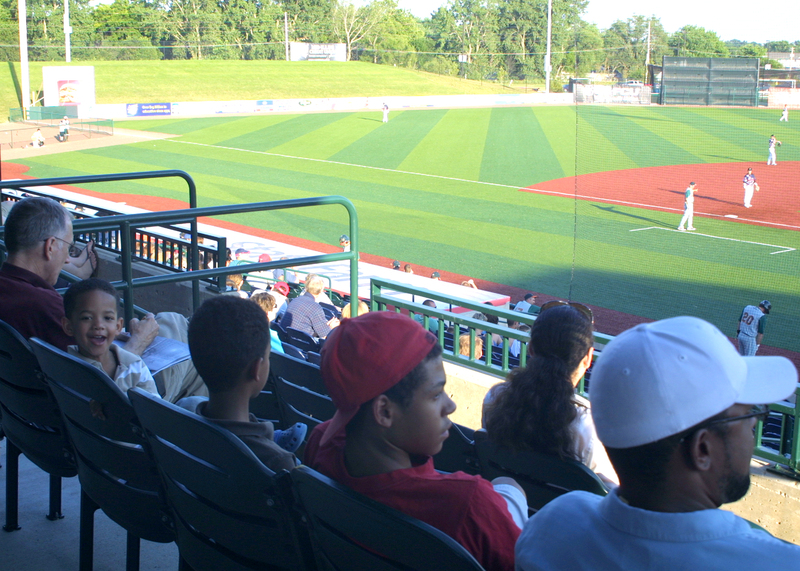 At the end of our day at the ballpark, there were two things that happened that were pretty fulfilling: 1) post tour – the fans told us how much they sincerely enjoy attending ball games at this facility, 2) for the first time I got to sit in the stands with my business partner and our families and just relax and enjoy. We are proud of our work.